MAPLES REP—The Church Basement Ladies are back by popular demand! Maples Repertory Theatre is proud to complete their 15th season with their 6th production featuring the singing, dancing ladies from the East Cornucopia Lutheran Church in rural Minnesota. This installment of the crowd-favorite, CHURCH BASEMENT LADIES series is AWAY IN THE BASEMENT: A CHURCH BASEMENT LADIES CHRISTMAS and will be showing at the historic Royal Theatre in downtown Macon, Missouri from Friday, November 23, through Sunday, December 9. 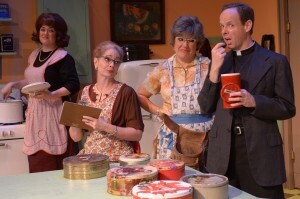 AWAY IN THE BASEMENT takes audiences back to 1959 and the day of the Sunday School Christmas Program. As they discuss the politics of the pageant and mend old bathrobe costumes, little do the ladies know what surprises are in store for them, especially as the widowed pastor contemplates spending Christmas with someone new. 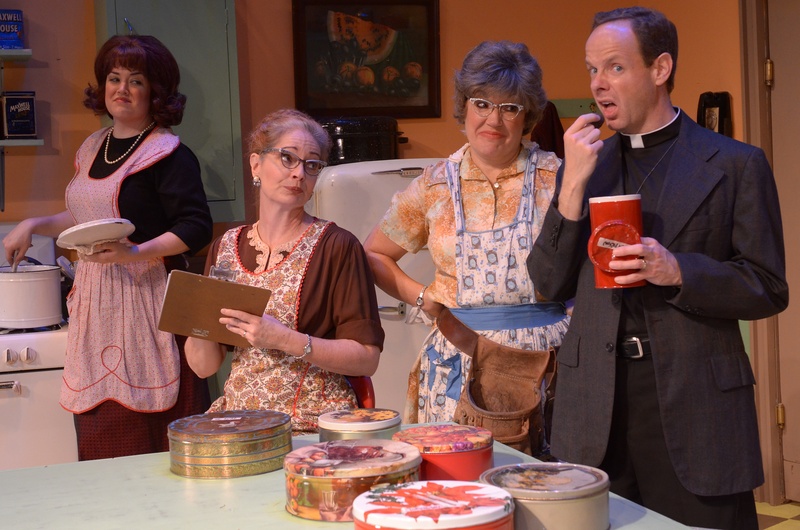 Todd Davison, Artistic Director for Maples Repertory Theatre and a big fan of church ladies everywhere, is excited to feature the Church Basement Ladies once again. “You certainly don’t have to be Lutheran to understand this show. Every church that I know of has a group of ladies who keep things rolling. Of course, there are some things embedded in the show especially for Lutherans, so if your neighbor is laughing at something you don’t understand, they may have Minnesota Lutheran roots!” This is most certainly true. Over the years the Maples Rep Church Basement Ladies casts have stayed remarkably similar with many familiar faces reprising their roles in the basement. Andy Brown is making his fourth appearance as the Pastor. Last seen at Maples Rep as Moonface Martin in ANYTHING GOES, Andy is from Chicago. Licia Watson, from Kansas City and New York, is playing Vivian, the head-of-the-kitchen, for the fourth time at Maples Rep. Dawn Trautman is joining us as Karin for her fourth MRT CBL. Although she is based in New York now, Dawn really is a Minnesota Lutheran and always helps give Church Basement Ladies shows the ring of truth. The only newcomer is Renee Bergeron who is making her Maples Rep debut as Mavis, the farm wife, a role she has played elsewhere…just not in Macon. Finally, Laurie Sutton returns to Maples Rep for her sixth Church Basement Ladies show. That’s right, she has played Beverly in every one of MRT’s Church Basement Ladies shows after first debuting as Laurey in their production of OKLAHOMA! way back in 2010. Laurie’s family is from Lawrence, Kansas and loves to come see her perform in Macon – much closer than New York City. All joking aside, Maples Repertory Theatre wishes you the best of the season and invites you to celebrate family and fun with them and the famous Church Basement Ladies in AWAY IN THE BASEMENT. Tickets are selling faster than you can say “Uff da” so call the box office or go online at maplesrep.com today!